I’mplanning to make three different flavour tiers for my wedding cake – a classic rich fruit cake on the bottom, a chocolate cake in the middle, and a ginger cake on top. 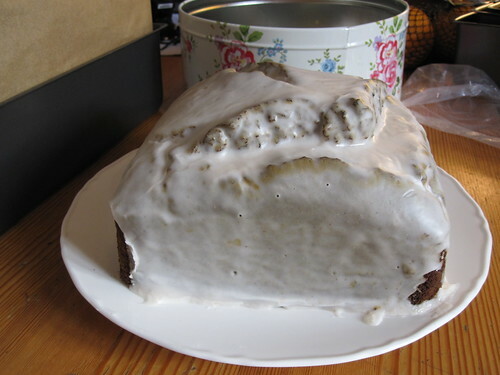 In search of a tasty ginger cake recipe, I did a test bake of a 7 inch square version of Dan Lepard’s Malt Whisky and Ginger cake, which I’ve had pinned on the fridge for ages but never baked. I doubled the recipe in order to fit the larger tin, and was a bit alarmed to see how sloppy the batter was, so I chucked in a little bit of extra flour. It also took about 1 and a half hours to bake, due to the larger size. Still, it’s been going down very well with my colleagues at work. Next I’m going to try the Gingerbread Guinness cake in my Tea with Bea cookbook, which will hopefully be a bit more well-behaved. This entry was posted in Cakes etc, Weddings. Bookmark the permalink.